Keep your ears protected from the unwanted effects of loud and sharp noise with the Pro Ears Predator Gold. Let your style stand out without compromising the comfort and security your ear has with this protective equipment. Equipped with Full Spectrum Sound Technology, the Pro Ears Predator Gold promises to let you her softer sound more clearly. In addition to that, it is also capable of removing tinny sounds. This hearing protection equipment employs DLSC Technology. Its structure comes with dual and fully-enclosed military grade circuit boards, along with gold connectors. Such features enable the ear muffs to give the user independent volume control. With this feature, an individual can adjust the ear level to his or her specific needs. It also allows adjustments for increasing or decreasing situational awareness through hearing. This hearing protection equipment also features ProForm Leather ear seals partnered with visco-elastic foam pads. These soft yet substantial materials provide the comfort needed by the one using it. Adjustments are also not a problem with these earmuffs since it has an easily-adjustable headband to fit any head size. As for indicators and warnings, users will be warned with a low-battery indicator once it has reached critical levels. To complement with this and resolve the issue, the ear protection device has a 3.5 mm jack for charging. Pro Ears Predator Gold also takes pride in its Noise Reduction Rating of 26, along with a response time of 11.5ms. With the help of these, an individual can experience enhanced awareness of the surroundings and at the same time excellent protection for one’s hearing organs. The comfort that this hearing protection provides is also very flexible. Whether one is in an environment with extreme temperature and weather conditions, its comfort and protection can still be enjoyed. Also, this muffs also promise to function well regardless if used indoors or outdoors. The materials that compose this equipment are exceptional, making the equipment of exceptional quality as well. Its other functions that enhance hearing and reduce unnecessary noise are also excellent. It has the most sought-after technology that provides outstanding hearing enhancement and reduction performance. Indicators make the use of this product efficient since it gives you a reasonable amount of time and warning to do necessary procedures. Headphones are somehow prone to malfunctioning after a long and consecutive instance fo usage. The headband, when used frequently, is prone to damage more than the earmuffs itself. 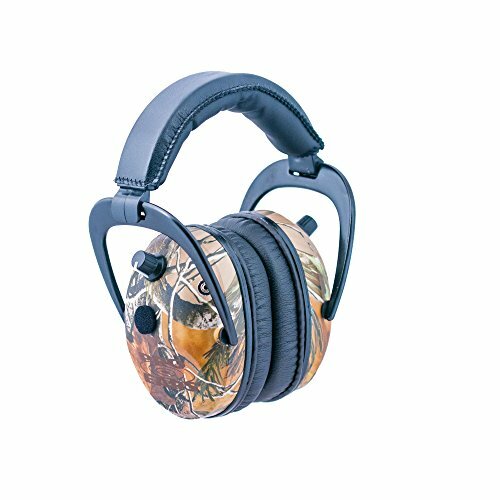 When it comes to the ear protection and comfort it provides, this product lives up to expectations. It has the most well-known and well-reviewed materials for optimal quality and functioning. Also, the technology it uses to provide what it promises already has a good name in the market. Its advanced features are great selling factors to many people. On top of that, style is never compromised by this product. It comes in different form and themes, perfect for any style preferences. Weather conditions are also put into consideration for the sturdiness and capacity of the hearing protection equipment. However, considering the reviews given regarding its durability, a user could be at the losing end. If one intends to use it frequently, then there might be some problems. However, if one wants to use it only occasionally, this device might be of service for a long time. The Pro Ears Predator Gold is an excellent item to have for people who are always in noisy environments. People who are very much into hunting, scouting, and wildlife observations will find this product useful. It has all the necessary features needed for effective observation as well as survival. Users can hear the sounds of animals from nearby and even afar with this equipment. They can also protect their ears from the sudden deafening sound produced by a gunshot when hunting. Such reasons follow the idea that hearing is a beneficial sense to use in such activities. Losing it or having some impairment regarding it can cause some troubles while doing the activities. Many users have also reported satisfaction regarding its comfort, sound reduction, sound enhancement, and durability. They have tried it on for their hunting trips and were able to use it for efficiency and effectiveness. Aside from these outdoor activities, the Pro Ears Predator Gold can also be utilized for indoor activities. This means the equipment can also be used for activities such as concerts, classrooms, and bar jamming. Given its stylish appearance and material, it is something that could not ruin your get up in such activities. Also, given the noise produced in places where these activities happen, one must always have protection device handy. As for the classroom setting, you can use this as a sound enhancing equipment to aid you better in listening and learning. In a setting where more often than not, noise is lessened, the Pro Ears Predator Gold could still perform well through its sound enhancement function. It can also help one focus more since it reduces the tinny sounds that could be present in the classroom. In all of the activities mentioned, noise pollution is indeed inevitable, posing the needs for an ear protection device. While Pro Ears Predator Gold might have negative reviews for its durability, many people have still reported to enjoy it. They were able to use it for a long time. Overall, the Pro Ears Predator Gold is a good find, with some reservations along the way. It has the most recommendable materials, technologies, and facilities to provide a fantastic experience. It can live up to many user’s expectations regarding its comfort and quality. However, upon purchasing this product, it is essential to keep a few things in mind. Notably, one must remember that the lifespan of this product is dictated by how often one uses it. The longer and the more frequent it is used, the more shortened its lifespan might be. Meanwhile, less frequency of usage might eventually extend the lifespan of this gearing protection equipment.